Letter from the Chief Medical Advisor, William Kim, M.D. 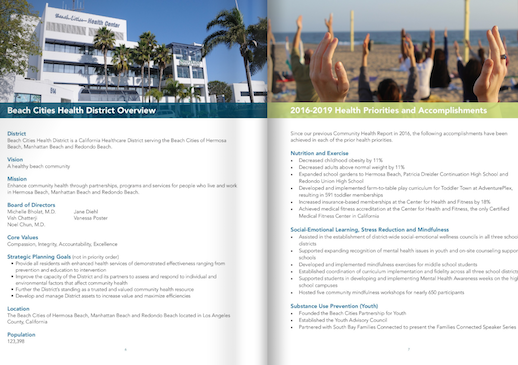 In 2005, Beach Cities Health District (BCHD) created a data-driven strategic planning process to prioritize funding and program implementation. The strategic plan calls for creating a community needs assessment, critically analyzing community health data and cultivating strategic partnerships to advance and realize BCHD’s vision and goals. One such partnership is BCHD’s long-standing, successful relationship with the Blue Zones Project®. The national community well-being initiative, launched in the Beach Cities in 2010, provides BCHD with unique access to a wealth of community-level data through the bi-annually administered Gallup-Sharecare Well-Being Index™(WBI). The WBI is a widely acclaimed measure of community, state and national well-being which BCHD uses to inform the development of strategic programs and policies aimed at measurably improving public health and well-being in the Beach Cities. In addition, BCHD also incorporates strategic directions and target priorities from the National Prevention and Health Promotion Strategy and Healthy People 2020. To access the Community Health Report 2019, click here. To access the Community Health Report 2016, click here.